A virtual collection of musings and meanderings. #GetFitWithMe Workin’ It Out In Paradise! Well it’s that time! I have arrived at paradise! Today, I stepped foot onto the beautiful white beaches and prepared myself to remove the coverup…whew, this is the skin-baring moment I have been anticipating since January when I started this journey. During my difficult runs and long, tiring workouts, this is the moment I had been preparing for. Now let me tell you guys – this is not where it ends. Actually, it will never end. Being fit and healthy isn’t a destination. You don’t get to the point you have been working towards and say, “Oh, well, I have reached my goal, time to slack off and start eating like I was.” NO, fitness is a process. Its a long, never-ending process. That may sound scary and intimidating but let tell you guys, IT IS WORTH IT! As long as you are working your body beyond its limitations, you are improving yourself. Improving your mind. your body, and your soul. So don’t give up, ever. What you do today, whether it be a 20 minute workout or a 2 hour workout, it is going to make you a better you. And don’t we all want to be the best version of ourselves?! That has been my mindset lately. I wanna be the best me possible. The best daughter, the best girlfriend, the best athlete, the best Christian, the best chef, the best sister, the best student, the best friend, I want to make myself proud at the end of the day! I encourage you guys to set these same standards for yourself. Start taking every opportunity you have to improve and run with it. Look challenge in the face, and tell it you are stronger than the fears that are placed upon you! “So do not fear, for I am with you; do not be dismayed for I am your God. I will strengthen you and help you; I will uphold you with my righteous right hand.” -Isaiah 41:10. Even the Creator of all things told us not to fear! So as you read, I was nervous about exposing my imperfect body to the entire beach..but I remembered, regardless of how many squats I did, or push-ups I completed, or miles I ran, I am fearfully and wonderfully made by an Almighty God. Don’t forget this ladies! Working out only perfects the beautiful bodies God has given us! Tonight I wanted to provide you guys with a basic workout and a simple, healthy Memorial Day meal for the upcoming holiday. I will be spending mine at a beach with people I love! I like to workout in a gym. I understand most people may not be equipped with a gym membership or the access to a gym. If not, all of these exercises can be completed using any type of weight! Try cans or bottles if you have those! Burpee Challenge to end! Try doing Burpees with correct form until failure (cannot complete anymore reps with correct form)! Next I wanted to share with you guys a quick and easy recipe for when you are in rush but want to prepare something healthy and delicious. I will pretty much eat anything you put in front of me, so it isn’t difficult for me to find and try new things. I encourage you to step out of your comfort zone and try some new healthy foods that will really impact your body. And never forget – you can’t out work a bad diet. 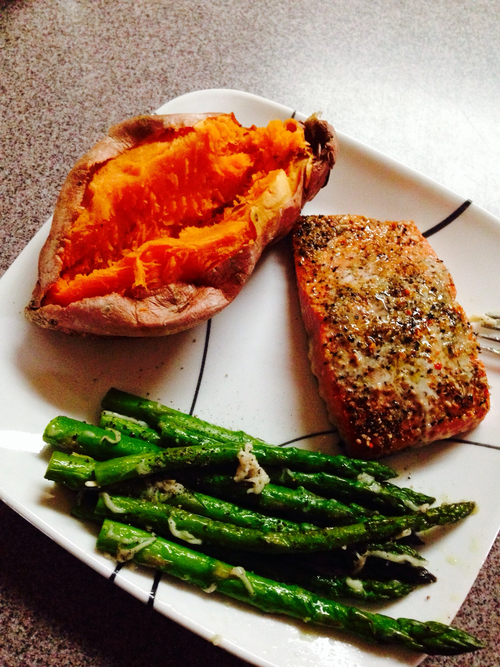 On tonight’s menu we have Seasoned Salmon with Parmesan asparagus and a sweet potato. YUM! For the salmon I simply took frozen Alaskan Sockeye Salmon and thawed it, placed it on some aluminum foil and seasoned it with Mrs. Dash’s no-salt-added seasoning. I cooked it for about 400 degrees for 20-25 minutes (these times and temperatures are just estimates, when I cook I usually just watch my food for when it is done!). For the asparagus I took fresh asparagus, washed it off and chopped off the brown part of the stem. Then, I wrapped them in tin foil and drizzled about 1 tbs of Extra Virgin Olive Oil and made sure they were all evenly coated. I took a pinch of Parmesan cheese and sprinkled on top. Add some salt and pepper to taste and cook at 400 degrees for about 10-15 minutes. For the sweet potato I just baked it on aluminum foil at 400 degrees for 1-2 hours (or put it in the microwave for 15 minutes)! And there you have it. A meal that takes a maximum of 30 minutes that’s full of nutrients, vitamins, essential fatty-acids and deliciousness! I hope you enjoyed this post! Let me know if you tried the workout, the recipe, or if you want to share your story and journey with me! We are in this together! We are told to carry each others’ burdens right? (Galatians 6:2) Love you guys!